Here’s your latest dose of inspiration and practical advice from fascinating radio show guests. This week’s Business Live programme covers winning government contracts, writing a business book, undertaking education as an adult and more. The podcast is below – guests are Emma Jones and Peter Byrom. Emma Jones founded Enterprise Nation, a network helping people to start and grow small businesses, and is the SME Crown Representative, working with Government to hit a target of spending one pound in every three with small firms. Peter Byrom looks after people’s hearing. 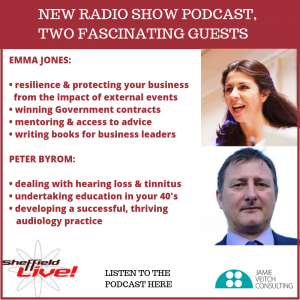 He runs Peter Byrom Audiology and has extensive experience fitting hearing aids, within the NHS and in private practice; he’s helped numerous business people who need to interact with clients and are worried about their hearing. What her role as SME Crown Representative means in practice – how is the Government going to achieve the objective of spending more with small businesses? Who’s inspired Emma, why and how? Developing his audiology practice, listing your business on directories and the power of positive reviews. 48:00 – end (50:40) forthcoming events and wrapping up. The Contracts Finder website mentioned by Emma; Enterprise Nation; and Peter Byrom Audiology on Yell. My own guide to help win public sector contracts.